This simple but useful update lets an advertiser see a live preview of her ad as she builds it in our DIY system. Before the updates, the preview was displayed on a separate page. Now our advertisers can save time and make changes on the fly, rather than clicking back and forth between pages. It takes a lot of work to create a great video, so getting quality views should be the easy part. With our new video ads feature, an advertiser can add his own Youtube or Vimeo masterpiece to an ad by dropping the URL into our DIY form. That’s it. No rich media fees. No extra production costs. We’ve always encouraged publishers to customize their Blogads ad zone to fit the unique look and feel of their blogs. Now we’ve made our as zones even more customizable. For the blogger who wants to fill the space in her wide sidebar, or place a row of Blogads between posts, we’ve added the mult-column function to all Blogads. 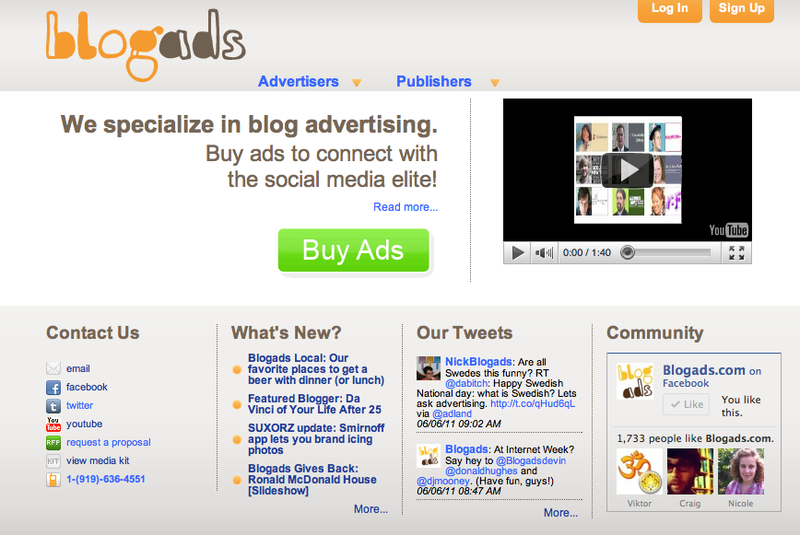 Now our bloggers can display up to six columns of ads to any of their adzones. In January we radically simplified our home page design. This allows advertisers and bloggers to find the information they need with minimal clicking. With a front-and-center video player, we can highlight new features as they roll out. The design also makes our community features more prominent, with links to blog posts, tweets, and Facebook page in the footer. We liked the new header and footer so much that we’ve added it to the blog, too. Just scroll up and down to check them out. In addition to the home page, we’ve also rebooted our “Why Buy” page for advertisers and “Sell Ads” page for publishers. The clean new layout of these page brings the most important information above the fold, highlighting out unique features and success stories from past advertisers and bloggers we’ve worked with. We’re always working to improve the Blogads experience for bloggers and advertisers alike. Is there a new feature you’d love to see? Let us know!